Anyone who has endured traditional court litigation can attest to the exhausting, costly and hostile nature of that process, which arbitration reduces. With each successive 5-4 U.S. Supreme Court decision in which Justice Neil Gorsuch provides the decisive vote, it becomes increasingly difficult for self-satisfied "Never Trump" conservatives and libertarians to rationalize their ostentatious crusade. Perhaps at some point the Ana Navarros and George Wills of contemporary punditry can enlighten audiences how a President Hillary Clinton might've withdrawn Barack Obama's nomination of Merrick Garland and selected someone equal to Justice Gorsuch. Until such time, however, their stubbornness appears more petty than righteous. Regardless, Justice Gorsuch offered another jurisprudential gift last week when he provided the pivotal vote to uphold an arbitration agreement between private parties in Epic Systems v. Lewis. First, a word about arbitration as a general matter. If someone claims that arbitration deprives aggrieved parties of justice, they are either uninformed or deliberately dishonest. Arbitration simply refers to a process for resolving legal disputes outside of the governmental court system. Just like traditional court litigation, the parties present evidence to a neutral third party, typically an experienced former judge, who renders a verdict. As is usually the case with private versus governmental alternatives, arbitration offers the advantage of quicker resolution, lower costs for all litigating parties, and less rigid procedural rules. Typically, the litigating parties mutually agree upon the arbitrator who will decide the case, which eliminates the possibility of random "jackpot juries" or erratic judges that too often characterize governmental court systems. Additionally, arbitrators typically exercise greater willingness to mediate the parties toward a more amicable resolution than acrimonious traditional court litigation. Arbitration can also occur more privately, sparing all parties from potential bad publicity and ensuring greater confidentiality. For those reasons, arbitration is typically a superior alternative for plaintiffs and the "little guy" as well as defendants and large institutions. And employers typically favor it because it reduces the likelihood of litigation costs that can drive them toward bankruptcy defending against even frivolous cases. Anyone who has endured traditional court litigation can attest to the exhausting, costly and hostile nature of that process, which arbitration reduces. It also merits emphasis that arbitration agreements aren't even enforceable if they violate standards of fairness, or deprive either party of acceptable forms of resolution and remedy. So who dislikes arbitration? Trial lawyers. Trial lawyers leverage the prospect of protracted and costly litigation, as well as jackpot jury verdicts, to drive opposing parties toward costlier settlement to their own benefit. Accordingly, trial lawyers and the political left unfairly malign arbitration and seek to deny it as a form of alternative dispute resolution. That's precisely what they attempted to do in the Epic Systems case decided this month. In that case, the employer and employee parties entered into employment contracts specifying individual arbitration of any future legal disputes that might arise. Despite signing those agreements, the plaintiffs later sought to commence a class action lawsuit in federal court. Under their theory, the agreements in question somehow violated the National Labor Relations Act by precluding the possibility of traditional class action litigation. Here's the problem with that claim. Until recently, courts across the nation, as well as the National Labor Relations Board (NLRB) itself, agreed that such arbitration agreements were perfectly valid and enforceable. As recently as 2010, in fact, the Obama Administration NLRB General Counsel opined that arbitration of this sort "does not involve consideration of the policies of the National Labor Relations Act." But as occurred in so many other Obama Administration bureaucracies, the NLRB arbitrarily and unjustifiably reversed course in 2012. According to the Obama NLRB's sudden epiphany, the 1935 National Labor Relations Act prohibited arbitration under the 1925 Federal Arbitration Act, despite the fact that courts and executive branch agencies failed for eight long decades to realize it. The NLRA secures to employees rights to organize unions and bargain collectively, but it says nothing about how judges and arbitrators must try legal disputes that leave the workplace and enter the courtroom or arbitral forum. This Court has never read a right to class actions into the NLRA - and for three-quarters of a century, neither did the National Labor Relations Board. Far from conflicting, the Arbitration Act and the NLRA have long enjoyed separate spheres of influence, and neither permits this Court to declare the parties' agreements unlawful. 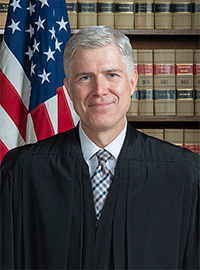 For good measure, Justice Gorsuch concluded in a way that validates the gratitude of conservatives, libertarians and any other supporter of constitutional fidelity when he wrote, "This Court is not free to substitute its preferred economic policies for those chosen by the people's representatives." May he long tip the Court's balance with that sort of jurisprudence.